Here we answer frequently-asked questions about all types of septic system pumps. Advice is given for septic tank effluent or sewage pump selection and use. 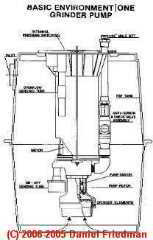 Recent questions & answers about septic pump types, applications, sources, repairs, posted originally at SEPTIC SYSTEM PUMPS - topic home. Be sure to review the guidance given there. I always prefer a gravity flow for waste or other water disposal as it means the system will continue to work when there is a loss of power. Be sure to include appropriate check valves in either design to prevent sewage backflow into the building. I am faced with a dilemma on my new building. I need to tap into a sewer line and I have two options. 80ft, level, flow using a sewage pump(grinder?) - cost $3700.00 plus the grinder. Is it woth saving money at the expense of a pump, or am I better off paying the extra money now with no future pump issues. I am putting a bathroom in our basement and i need to pump waste to my septic tank from the basement up a hill to the tank is a solid waste pump all i need and how deep do i put the pipes under ground? Don, Cloroben and other manufacturers produce drain cleaning liquids that are enzymes that should not harm a septic system. But I'd expect the smell to return as the system is used. Better to find the exact odor source and fix that - assuring good plumbing venting, no leaks at toilets or equipment, etc. Question: What to do about a grinder pump that keeps getting clogged with string, cigarette butts, etc. Anon: in the text above and also at TOILETS, DON'T FLUSH LIST we advise against ever flushing cigarette butts, dental floss, or string down building drains, precisely because, as you report, they can clog and even burn up sewage pumps by entering and binding the impeller assembly. There may be large capacity commercial grinder pumps that can better handle these problems than a residential sewage pump, but to me that seems a big expense that should not be necessary when cooperation by the building occupants can avoid these costs. At the bottom of this page in our references section you'll see contact information for Grundfos, one of the larger manufacturers of grinder pumps. Give them a call to ask if they have a residential-sized unit that can tolerate some of the abuses that your system suffers. Stumpman, The wiring diagram for septic pump alarms are surely included with the alarm itself. Basically, when the pump fails to run when it should, the rising effluent level in the pump trips an alarm sound and light. If you give me the brand of your septic alarm device I'll research this and get details for you. Question: Sump pump float replacement vs pump replacement? The float switch assembly on at least some sewage ejector pumps is a replaceable part. Check the installation manual for your sewage grinder pump and you'll see part numbers to order an exact replacement, though generic switches are also available. If you can't find that information, tell us the brand of your pump and we'll research it for you. Watch out: there may be some pump models whose water-tight assembly does not encourage replacement of the float switch. The problem is that the electrical components have to be absolutely water-tight to avoid electrocution hazards. But even in the case of an integral float switch that cannot be repaired without breaking the water-tight seal on the pump assembly, it may be possible to simply tie off the old floats to keep them out of the way (avoiding fouling or tangling the replacement floats), followed by installation of an independent float switch control assembly. Independent float switches include a submersible float switch that is inserted into the pumping chamber, along with an electrical connector that plugs in above ground between the existing pump electrical power connection and the power source. So no electrical connections are exposed to wet conditions. Question: Check valve on sewage ejector pump? Indeed it's not unusual for a check valve on a sewage ejector pump to become sticky or clogged, allowing sewage to drain back into the pump and thus causing the pump to come on more frequently than desired. Worse, depending on piping arrangement in the building, other wastewater from other fixtures higher in the building may drain backwards into and even clog the check valve. So if your sewage ejector pump is cycling even when the fixtures that drain directly into that pump system are not in use, I suspect in-drainage from other parts of the building. Septic pumps, sewage pumps, or sewage ejector pumps, which we discuss in detail beginning at SEWAGE EJECTOR / GRINDER PUMPS, are designed to remove sewage from a building where plumbing fixtures and their drains are lower than the building sewer line and/or septic tank. How often do you recommend pumping out the tank where an effluent pump is located? For septic *tank* pumping frequency, take a look at the suggestions at SEPTIC TANK PUMPING SCHEDULE (article links listed at the ARTICLE INDEX the bottom of SEPTIC SYSTEM PUMPS ). If the septic tanks are working properly, that is they are being pumped on schedule and checked for damage such as lost or broken baffles, the rate of accumulation of solids, scum, and sludge in the effluent pumping chamber is much less. I have not found a design specification for that condition but my experience suggests that you have the effluent pumping chamber pumped after the first year of use so that you can obtain data on the rate of accumulation of scum and sludge in the tank. Most likely that will indicate that you will be able to extend the effluent holding tank pumping frequency to a longer interval. But in sum, I'd base it on experience not on a table, and I'd be sure that someone is monitoring the maintenance of the individual feeding-septic tanks. One broken septic tank baffle could send a large volume of solids into the pumping chamber and thence it would damage the drainfield. Question: do we need a septic tank ahead of the lift station? We are installing a simplex sewage ejection station in a new house. The town has asked us to install a 1000 gal septic tank before the lift station. Is this a recommended step? It seems redundant and unnecessary. - Nick P.
A concern that there was a need for separation of solids from effluent - not something that makes sense if we're talking about a grinder pump lifting to a public sewer. A concern that the design needed a buffer or holding tank to permit accumulation of septage to permit the residents to continue to use toilets and plumbing systems for some period in event of a power failure. You need to discuss their reasoning with your town officials - find out what the worry is. If it's the need for a buffering tank, the solution where a grinder pump is installed probably lies in the specification of the size of the main pumping chamber, not the requirement to install a septic tank ahead of the pumping lift station. After all, once installed, the septic tank will remain always full anyway. It wouldn't do a thing for you except add maintenance costs. Question: We added a septic pump when adding a basement bathroom - how can we avoid using the pump? We used to have a natural gravity flow to the septic system until we added a bathroom in the basement which required a septic pump (but everyone around here always call it a sump pump). Reply: how sewage grinder pumps work; what's the difference between a sewage pump and a sump pump? 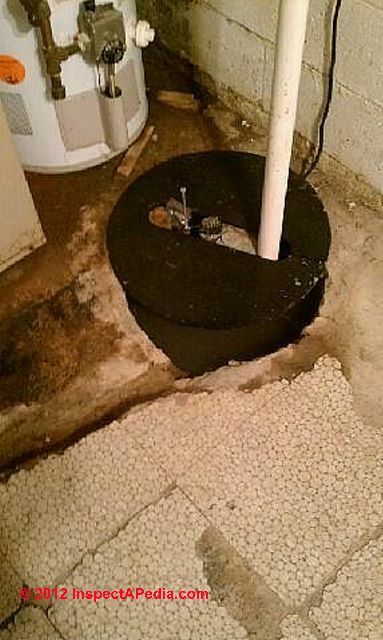 Most often the addition of a sewage ejector pump to allow installation of a basement bath becomes necessary because the bathroom floor is lower than the existing sewer line. The pump has to lift only the waste from the new bathroom - up to the existing sewer line where it then flows by gravity out to the existing septic tank or sewer system. You don't want to put a manual switch on your basement bath's sewage pump - the pump will run only when that bathroom is used. By the way, while people may speak carelessly about what these pumps are called, the proper term is sewage pump, sewerage pump, sewage ejector pump, or grinder pump. These pumps all include a grinder that macerates solid waste so that it can flow up through smaller-diameter piping to a point where it empties into the main building drain. A sump pump is designed only to pump water, such as ground water, or graywater from a laundry sink. If your plumber installs a sump pump into a pit handling solid waste, it won't last long at all - it's the wrong pump. Hello and thank you for your help. We have a lift station with a lead and lag pump. Pump one is short cycling and I don't know why! We have a new Warrick 67 intrinsic safe 2 pump controller. The controller test out fine how ever when we leave both pumps in auto when pump it's pump ones turn it short cycles. Why? We also think we have a float issue and we are in the process of getting a new one for the well. With a duplex pump system. And chances are you already have the manual. an actual wastewater level sensor defect. At this point I'd call Warrick for smarter help than I can offer. Warrick can be called directly at 1-800-378-1600 - and as they know their controls best, that may be the smartest move. I'm really glad there are people that do this for me. I don't think I could do that on my own. Thanks for the great article! thanks so much Tara. If questions arise, just ask. Your questions help us learn where to research or write further. Ive got an norweco/singalair aerobic system at my home and have a final tank effluent pump that's bad. it pumps effluent water up hill to a dechlorant station about 50 yards. the pump has a 2" pvc pipe coming out to distribution. its 115 volt pump. the pump is controlled by a pump control system with a low and high water control norweco/singalair system. i need to now exactly what pump I need. what horse power and volume.whats the best pump for my system. its got a single cable coming out of the pump going under ground back to the control unit under the house.im putting a new waterproof outside electrical control box outside to tie in all the electrical components from the lo and high water switches and pump into the box and can tie the connection from the effluent pump to the underground connection in that box.i just need to know what pump I need to buy? For the most-expert help with a Norweco - Singulair areobic septic system I'd give the company a call directly. i have an alarm sounding. had the septic pumped and all was well with system. alarm still going off. we took off lid to pump tank and can see top of pump so it is not full. Question: what can we connect to the ejector pump system? Does an ejector pump serve any unit in a building besides the below grade unit? Thank you - our Association is trying to figure this out! Possibly yes. An ejector pump will grind and pump whatever is drained into its reservoir. It's technically possible to drain an upper floor fixture into an ejector pump installed below grade. Thank you Dan Joe! Good to know it is possible...but is it likely? (we are an 8 unit building, with two lower units, both with Ejector Pumps, and Sump Pumps) My inspector said the Ejector Pump only served my unit....... I appreciate your quick response! We have a basement bath (shower, toilet, sink) and an ejector pit to pump the waste into the sewer line. Both were installed approximately 7 years ago when we added on to our house. Unfortunately, we have burned out 3-4 pumps since completing our addition, usually right after an overnight guest has been using the bathroom. Use at other times is infrequent and limited to the toilet and sink. Most guests stay for a week or less and with the exception of one guest, I know that nothing unusual is being put down the toilet but still the pump burns out. The last time was just after Christmas and we ended up with a basement flooded with contaminated water! We have now replaced the pump (again) so we are good until the next guest comes to stay but this is getting old. What is causing this and, more importantly, what can we do to solve the problem? One plumber told us that there isn't a long enough run between the shower/toilet and the ejector pit but I don't know why this should make a difference or what we could do to fix it. The only other thing going into the ejector pit is waste from a sink in an adjacent sewing room but again, the flow is minimal. An ejector pump should last for some years. 1. are we sure you're buying and installing the right kind of pump: a sewage grinder pump not a sump pump? 3. what is the lift requirement in height and how does that compare with the pump specs? 4. is there a check valve that's not working, causing the pump to cycle repeatedly when it should not have to do so? 5 Is the pump protected from clogs from stuff that shouldn't be flushed down drains such as dental floss, tampons, etc? I have a friend who lives on a rural property, serviced by well & septic. He is receiving chemotherapy for prostate cancer. It was his oncologist( who also lives on a property with well & septic) that suggested he rent a Portopottie to use while he was being treated. Doc said my friend's human waste could contain enough residual of the chemo to upset or kill off the bacteria in the septic system. Doc also said the same thing could be true of people on extended course of certain strong antibiotics. It makes sense, but has anyone else ever heard of it before?Does Doc know septics or should he stick to medicine? and at DRUGS INTO the SEPTIC TANK? However I'm not sure that a single individual's drugs are enough to kill off septic tank bacteria and I've not found any authoritative research that supports the argument for individuals. Where such problems were reported they involved multi-occupant nursing homes and hospitals. Continue reading at SEPTIC SYSTEM PUMPS or select a topic from closely-related articles below, or see our complete INDEX to RELATED ARTICLES below. Or see SEPTIC PUMP FAQs-2 - more-recent Q&A about sewage and septic pumps. SEPTIC PUMP FAQs at InspectApedia.com - online encyclopedia of building & environmental inspection, testing, diagnosis, repair, & problem prevention advice.